In dotCMS framework  (before version 3.6.0) it was possible to re-use valid CAPTCHA (Completely Automated Public Turing test to tell Computers and Humans Apart) code. Proof-of-Concept is made with dotCMS version 3.2.1. 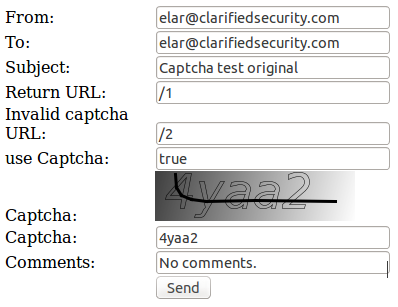 Attacker must first fill manually valid CAPTCHA code. No other pre-conditions - no authentication or authorization needed. From Email Header Injection vulnerability testing I already had one form for sending emails via dotCMS /sendEmail/ service. Cookie: dmid=41559441-3e57-4be0-b092-25f8a2115323; JSESSIONID=9F6D8F2888F46955A584F9933A140785; SHARED_SESSION_ID=3MPCQRQT9611; ..trackercookiesremoved.. It's easy to use Proof-of-Concept POST request and automate it. Usually, I open FireBug plugin in Firefox' Net tab, right-click on the request I want to submit and click on "Copy as cURL". Benefit copying cURL command that way is that the fingerprint on the server for cURL command is the same like it was with browser. Which also means that this command contains all the cookies, including the session cookie. As the last loaded and valid CAPTCHA code is stored in session, the session cookie is exactly what we need for our exploit. I just created for loop for sending 10 emails. Subject for each email will be "captcha test NR". In given example command is formated to multiline for better readability. This proved that it is possible to reuse valid CAPTCHA code. CAPTCHA code is renewed when you reload /Captcha.jpg from server. But if you don't reload it, you can use previous valid CAPTCHA code till your session is alive. Reported problem is fixed in dotCMS version 3.6.0. 2016-06-29 | me > dotCMS | any comments or feedback? SecurityFocus: "dotCMS CVE-2016-8600 Security Bypass Vulnerability"
FullDisclosure: "CVE-2016-8600 dotCMS - CAPTCHA bypass by reusing valid code"
VulDB: "dotCMS 3.5.x Captcha Bypass privilege escalation"